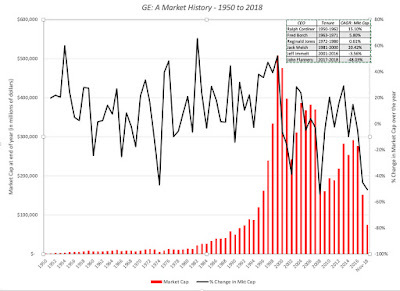 Musings on Markets: The GE End Game: Bataan Death March or Turnaround Play? I think the multiple for the aviation business is way too low. The "real" peers (Safran, Rolls Royce, United Technologies' Pratt & Whitney) command much higher multiples. The "Aerospace/Defense" industry could be more relevant than "Air Transport". 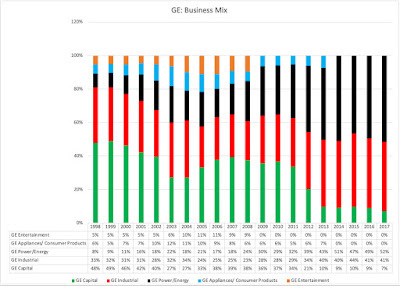 What is the probability that GE can receive a government bailout if they do declare bankruptcy? I'll watch your very much appreciated video soon, but I didn't see any comment about pension liabilities, which are, I understand, significant. 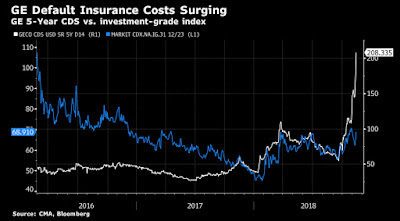 Given the economic cycle, it may not have an opportunity to grow revenue sufficiently to avoid insolvency and bankruptcy, which seems more likely than recovery in the out-years. Technically, the stock seems like the 'falling knife'...if I were a buyer I would expect an opportunity during a long bottoming process. 1. 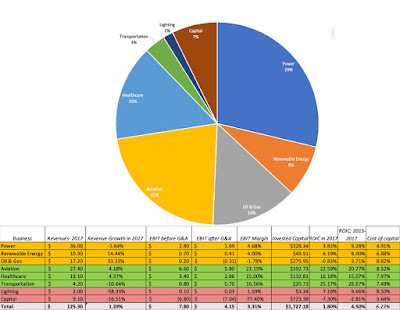 Why exclude underfunded pension and retirement health liabilities? Together they are $30 bn. These two items more or less wash out so the valuation is roughly the same, but would be interesting to hear your reasoning here. 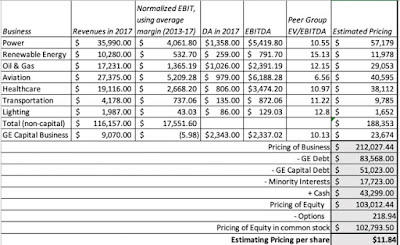 The valuation for GE Capital in the SOTP valuation seems wrong. 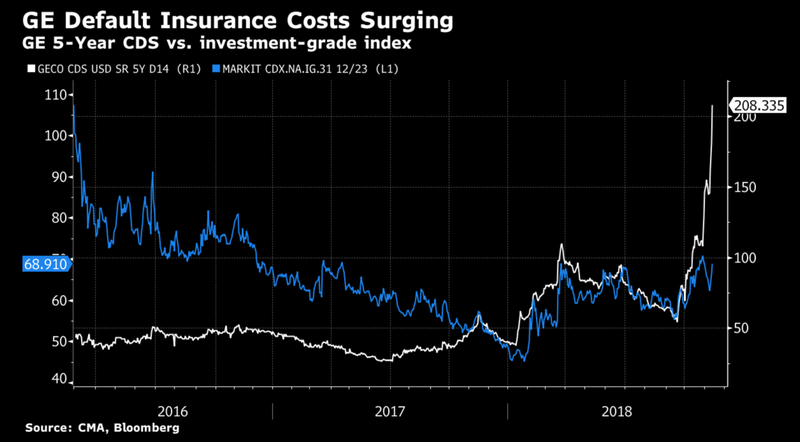 How can it be worth more than Healthcare when healthcare has more revenue, positive earnings (vs. negative for Capital), a higher ROIC and higher expected growth? It seems like there is an error in the spreadsheet. 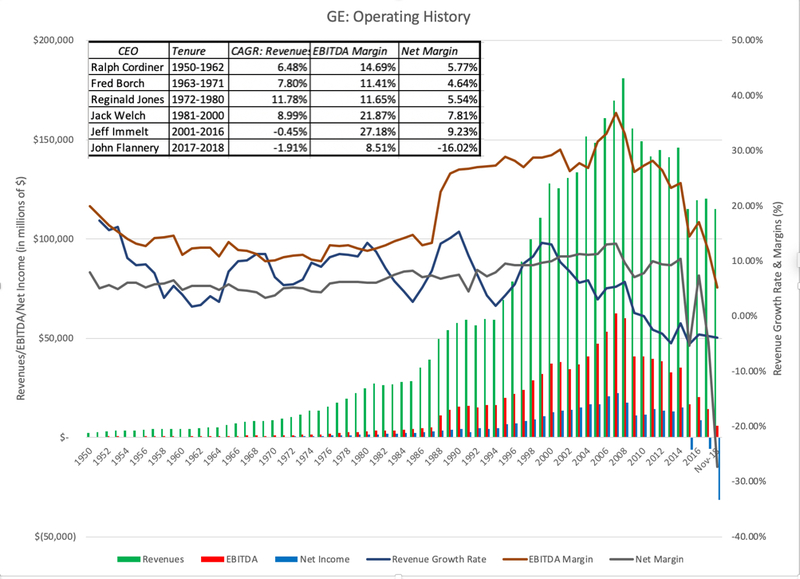 If I change GE Capital's Expected growth for the next 5 years to 0 it makes the business worth close to 0. 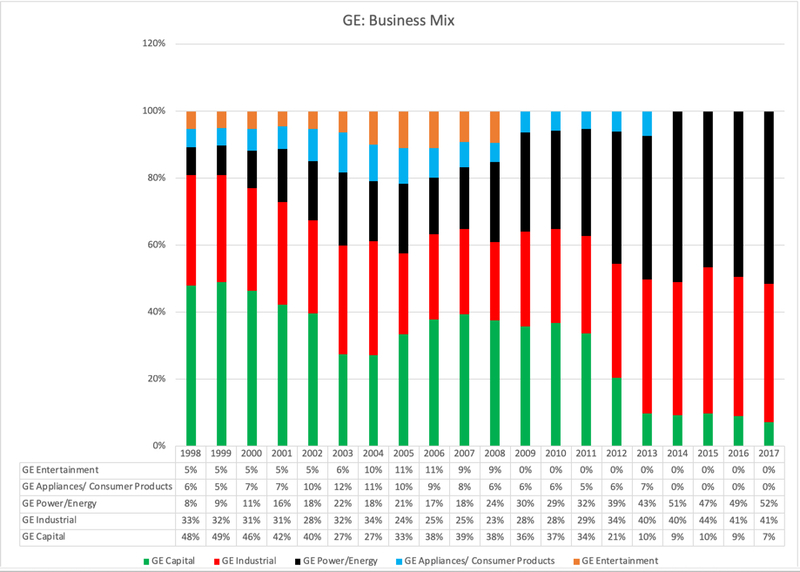 Your comment about GE's business units being essentially stand-alone may not be accurate: GE Capital has been a substantial purchaser of GE's industrial receivables, boosting operating cash flows at the expense of cash flows from investments and financing. 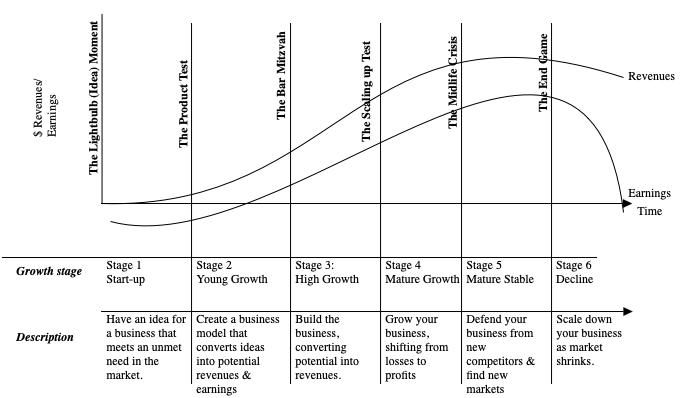 Secondly, applying peer multiples to these businesses ignores the operating challenges that have been reflected in their reporting; even before allowing for slippage in a (forced) sale process, it seems unlikely that they should be priced on par with their better capitalised, faster growing peers. Moreover, before pricing the EBITDA, one needs to have some degree of confidence around that number: GE's accounting has been famously impenetrable, as evidenced by the gap between GAAP earnings and cash flows, and the ongoing investigations into its book-keeping by regulatory bodies. 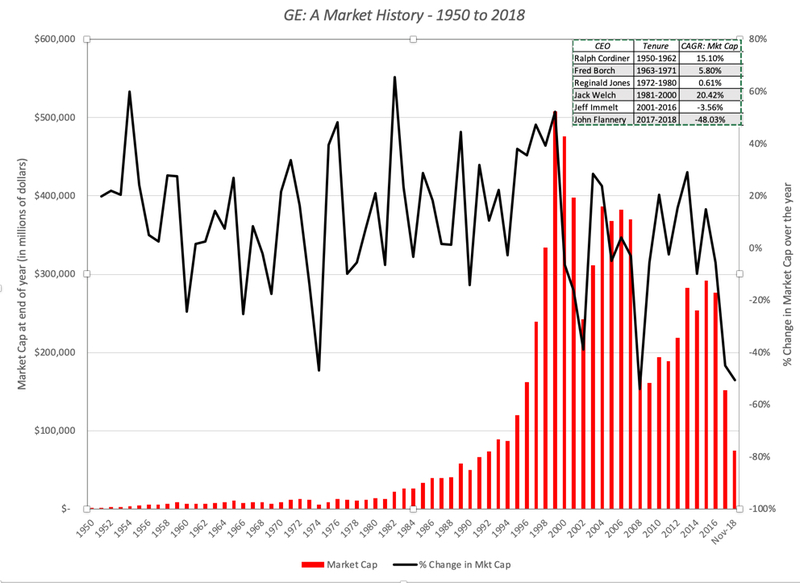 Fourthly, some of the regulatory scrutiny that GE has attracted relates to its accounting for long-life sales, such as warranty reserves. Apart from the fact that (again) the company's accounting might prove difficult to rely on, it's important to note that its balance sheet and credit ratings are both important with respect to the P&L: nobody is buying a 20 year asset with an attached service contract from an uncreditworthy entity.... and that introduces the possibility of a vicious circle which the EBITDA multiples doesn't contemplate. And of course, there's that pension (incidentally, the second largest holder of GE stock). 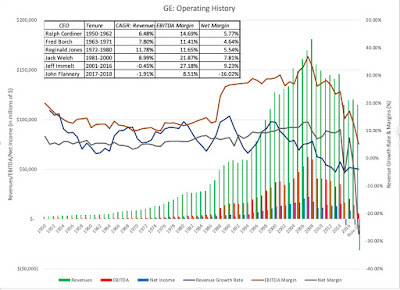 As you note, GE is an unbelievably complex company, both to value and, apparently, to manage. I think your SOTP pricing ignores the operating realities of the individual business units, glosses over the linkages between them, and discounts a range of balance sheet items that could prove problematic. 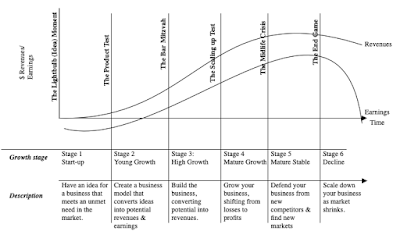 should I add illiquidity discount to measure the investment value?